Editorials from Theslowlane: Terri Schiavo feeding tube culture of life? Terri Schiavo feeding tube culture of life? Weren't the Republicans the ones trying to remove the feeding tube? My latest cartoon idea. Democrats should use this controversy to point out Republican hypocrisy and advocate access to health care for all Americans. Republicans have gotten themselves into a trap, but Democrats may not be smart enough to take advantage of this. "Always err on the side of life." Democrats should use this to advocate better funding for health care access to low income and uninsured people. Democrats should use this to oppose cuts in the nation's "safety net." Access to health care for all citizens should be advocated as a "right to life" issue. My fear is that Democrats will miss this great opportunity. 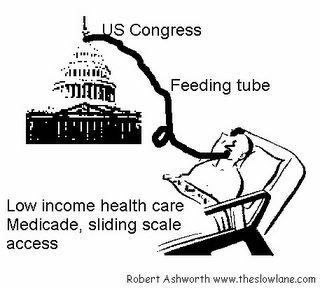 As for weather the feeding tube should be replaced, or not, it should not be up to the politicians (unless they can't trust the doctors working on that case). Maybe an independent team of doctors could be put onto the case so Terri Schiavo, her parents and husband could have a second opinion. If the doctors say she is (basically) dead, it is up to the doctors, and the families involved, to make the decisions. As long as the doctors are acting responsibly, including allowing for "second opinion," Congress and the President have no role; in my opinion. Since Congress and the President have taken on this role to make pronouncements about erring on the side of life, Democrats should use this to advocate access to health care for all Americans. Gay congressman Barney Frank once said that Republicans believe that life begins at conception and ends at birth. life. That's clever. He's got a lot of insight.